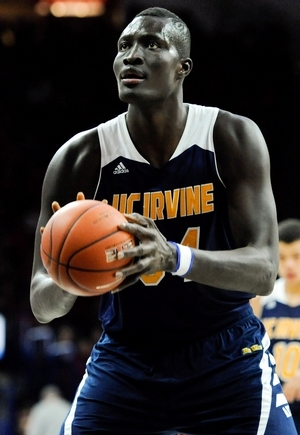 Jacob breaks down Mamadou Ndiaye, a 7-6 junior center for the UC Irvine Anteaters. Mamadou Ndiaye’s journey from Senegal to the NCAA Tournament took a number of twists and turns along the way. He left Senegal as a teenager to pursue a career in basketball – a sport he didn’t play growing up. Then he had to overcome a pituitary gland tumor, which threatened his life once he got here. Still, last March, it wasn’t his backstory as much as his undeniable effectiveness that had Ndiaye trending on Twitter as his UC Irvine Anteaters took the Louisville Cardinals down to the wire in the first round of the tournament. At 7’6 and with an unprecedented 8’1 wingspan, Ndiaye is simply the longest specimen to ever play in the NCAA according to our database. At 300 pounds, he has a big frame, but is still quite a ways away from optimizing his conditioning, strength-level and overall athleticism. Still, at the college level – particularly in the Big West – Ndiaye is able to get by with limited skill and thrive on size and length alone. As a sophomore he was limited to just 14 games with a foot injury, but he still averaged 20.9 points,10.5 rebounds and 3.4 blocks per-40 minutes pace adjusted. Ndiaye had an extremely promising freshman season in 2014 and that perhaps set expectations unrealistically high for him as a sophomore. What figured to be his calling card as an NBA prospect – elite rim protection – saw a major regression in year two as his block rate dropped from 15.1% to 8.5% as a sophomore. Per-40 minutes pace adjusted, his block averages also dropped substantially from 6.1 blocks to 3.4 blocks. Injuries, always a major concern with players this size, clearly took their toll on Ndiaye last year, so it will be interesting to see how he bounces back in this regard. UC Irvine plays a zone with Ndiaye anchoring the middle, and rarely leaving the paint, which is ideal considering his limitations. Still things would obviously be very different for him at the NBA level, with the defensive three second rules which prevents teams from utilizing exactly this strategy. Ndiaye’s poor conditioning and slow reaction time could be an issue as he transitions to the pro level for that reason, and he already struggles with foul trouble even in the Big West conference, posting an unflattering 6.4 fouls per-40 minutes with pace adjusted last season. Like many players his size, getting up and down the court for any duration of extended time proves to be a struggle for him. He labors with his movements on a full court sprint and often gets winded within a few minutes of court action. Offensively, Ndiaye feasted against his opponents in the Big West – where there weren’t any other players above 7’0 tall. According to Synergy Sports Technology, Ndiaye converted on 49-of-75 (65.3%) field goal attempts around the basket. When he gets the ball in the paint, he’s so tall and long that he doesn’t even need to jump to put the ball in the basket. The problem is, if there’s any obstacle between him and the basket, Ndiaye’s unrefined offense usually prevents him from scoring. He has minimal touch on his shot – regardless of how close he takes it from. The shots often clank off of the back rim and out. His awareness is also somewhat of an issue, as he’s often a step slow reacting to things occurring on the floor, particularly when it comes to catching the ball with his average hands. He’s generated an assist on just 1.8% of his possessions at the college level (dead last in the NCAA), compared with a sky high 20% turnover rate. Still, with his size, Ndiaye predictably gets fouled often, attempting 7.8 free throw attempts per-40 minutes with pace adjusted. Regardless, his poor touch translates from the line as well, where he converted on just 51.8% of his free throws. To his credit the 51.8% is a step up from the 43% from his freshman year, so that’s encouraging. Ndiaye really hasn’t had many opportunities to prove himself against quality opponents. He dwarfed Montrezl Harrell in the tournament en route to 12 points and five rebounds in 30 minutes. Still, having just one block in that game was discouraging. Against Arizona’s Kaleb Tarczewski, Ndiaye shot 3-for-5 from the field with nine points and five rebounds (also just one block) in 25 minutes. At the adidas Nations this summer, he really struggled against elite college players, which may have hurt his stock considering how many NBA scouts were in attendance. Overall, Ndiaye is an intriguing project because of his obvious potential as a rim protector. Still, his injury issues and general decline in productivity was discouraging last season, a trend he will have to rebuke as a junior to ease scouts’ worries.